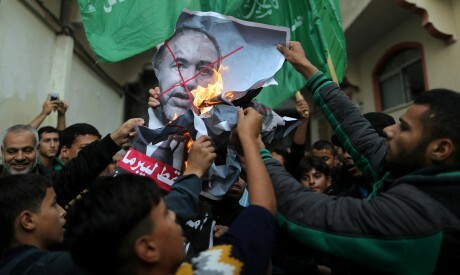 The resignation of Israeli defence minister Avigdor Lieberman last week ushered in a new phase in the Israeli-Palestinian conflict. Some regard the resignation of the hawkish minister, who described efforts to reach a truce with Hamas as “capitulation to terror”, as a victory for the Palestinian resistance. After accepting Lieberman’s resignation, Prime Minister Binyamin Netanyahu took over the defence portfolio, thereby putting himself at the head of three ministries— foreign affairs, health and defence — not to mention the government as a whole. His coalition also retains a slim 61-seat majority in the 120-member Knesset enabling it to remain in power without having to call for early elections. Netanyahu, who is shrewder and more experienced than Lieberman, knew that a ceasefire with Gaza, at this time and in this manner, would cause him some trouble, which he would be able to absorb, while a war against Gaza could bring his defeat in the next elections, said writer and journalist Suleiman Abu Arshid. Simultaneously, Netanyahu realises that the decline in his popularity will not increase the popularity of a strong rival, such as the Labour Party, but rather that any popularity loss would be distributed among the collection of parties from his own right-wing camp and that no matter how large these parties become they will remain mere branches or limbs of the larger Likud Party, which he heads. Abu Arshid also observed that, at the more general political level, Netanyahu’s agreement to the truce “stemmed from the realisation that there is no military solution to the question of Gaza and that the solution has to be political. In fact, the recent tensions, which originated from the failure of a military operation in the heart of Gaza, occurred in the midst of the prelude to a political solution,” he said explaining that the solution took the form of a transfer of Qatari funds to pay the salaries of government employees and it was preceded by the delivery of amounts of fuel necessary to increase the hours of electricity generation in Gaza. Netanyahu depends on such arrangements in order to promote his tactic of dealing with Gaza as a separate entity from the West Bank, thereby prolonging and deepening the political and geographic rift between the West Bank and Gaza and depriving the Palestinians of a unified representation locally and internationally. This tactic furthers the strategy of the Israeli right, which is to back out of the two-state solution by isolating Gaza and to entrench the system of self-rule regions in what remains of the West Bank after the annexation of Area C to Israel and the recognition of Gaza as the Palestinian state. Political analyst Adnan Abu Amer observes that we are still in the process of analysing the ramifications of the military setback that Israel sustained from its recent aggression against Gaza. “It is nothing new that the Israeli violation of the ceasefire understandings, which had been brokered by Egypt, Qatar and the UN, gave the resistance the political justification for activating its military capacities in order to retaliate against that flagrant violation,” Abu Amer continued. The resistance had clearly notified all those parties that it was in a position in which it had no alternative but to respond to the Israeli violation which came as a slap in the face to all those regional and international efforts. “True,” Abu Amer said, “the resistance did not wait to receive a go-ahead from those mediators, even though it appreciates the important role they play in stabilising the situation in Gaza. Mediators, encouraged by the resistance’s restraint, condemned the Israeli aggression and held Israel responsible for any deterioration in the situation in Gaza. An instance of this restraint was the resistance’s decision not to shell an Israeli bus carrying IDF soldiers, despite its ability to do so. That instance conveyed a significant political message, Abu Amer said. It stated that the resistance was not inclined “to bring down the roof of the temple on all inside” or “to break the rules” or “reshuffle the cards” even if there was no alternative to a military response to Israeli aggression. According to Abu Amer, it appears that Israeli decision-makers grasped the message and digested it, as difficult as this may have been for them. Perhaps this was because all sides converged on this point, which was to avoid escalation to an open confrontation which would destroy everything. Meanwhile, it also appears that Netanyahu is keen to take advantage of the closest ever ally he has in Washington, US President Donald Trump, and that he realises that he may never again have such a unique opportunity to put paid to the Palestinian cause. This means that he cannot afford to waste time in domestic squabbles and cabinet reshuffles and that his priority, now, is to help produce that “Deal of the Century” which has been the subject of so many leaks and conjectures. In September, Trump said that he would propose the plan within two to four months. According to a report in The Jerusalem Post, this would occur in December or January unless the forthcoming elections were brought forward from their scheduled date in November 2019 to February or March. In that event, the US administration would probably put off unveiling the so-called “deal” because it would make no sense to propose it without a government in Israel to accept it. According to journalist and political analyst Hani Al-Masri, some members of the administration in Washington favour proposing the deal as soon as possible in light of an unprecedented wave Arab-Israeli normalisation and other developments, such as the repercussions from the assassination of Jamal Khashoggi. The Gulf countries, in particular, are more inclined to support the deal now than they were before or, at least, they are less keen to oppose it. However, Al-Masri stresses, all such talk is pointless in view of the steps that the Trump administration has already taken to implement the “deal” before unveiling it. These steps began with the move of the US Embassy to Jerusalem, the recognition of Jerusalem as the capital of Israel and the annexation of the US consulate to the embassy (the US Consulate in East Jerusalem has been there since 1844, which is to say more than a hundred years before the establishment of the Israeli state), all of which were intended to eliminate the question of Jerusalem from final status negotiations. In addition, the US has also halted its support for and called for the elimination of UNRWA, it altered the definition of refugee so as to reduce their number to only 40,000, it has suspended its support for the Palestinian Authority (PA) apart from its security functions, and it has shuttered the PLO (Palestine Liberation Organisation) office in Washington. At the same time, it has pressed forward with the plan to sever the West Bank from Gaza and to legitimise Israeli settlement expansion, which Trump claims does not hamper prospects for peace, while David Friedman warned that to dismantle a single settlement would trigger an Israeli civil war. Many who support the deal believe that there is no reason to fear if the deal fails to win support after it is proposed since it is already being carried out on the ground and since failure would not reverse the de facto realities it has created and the fact that the Trump administration has changed the rules that have governed the political process for decades, making it impossible for any future president to turn back the clock. One of the factors that would propel Trump to announce the deal sooner rather than later is the results of the mid-term elections in the US. These were hardly as spectacular for the Republicans as Trump had claimed. Democratic Party control of the House will hamper Trump in legislation and accelerate action against him in the framework of the investigations into Russian tampering in the presidential elections and other scandals. He would therefore be more inclined to use foreign policy, and specifically the Arab-Israeli conflict, as a means to score a historic achievement that would enhance his prospects in presidential elections two years from now. In Al-Masri’s opinion, regardless of whether Trump unrolls the deal now or later, or not at all, the situation of the Palestinian cause will remain dire. In view of Arab confusion and fragmentation, the upheaval in priorities, and the lack of an effective and unified project or mode of action, the Arabs and Palestinians will remain unable to take advantage of any opportunities that present themselves or to repel dangers when they arise. *A version of this article appears in print in the 22 November, 2018 edition of Al-Ahram Weekly under the headline: Victory for Gaza resistance?